May 2014 was a significant one in the life of what was once Dursley's major employer, Lister-Petter. With the company being dissolved and the assets transferred to a new company, Dorset Road One, based at Aston Down, near Minchinhampton, it was time to clear things out. A visit inside the factory towards the end of May showed a very sorry sight, with most areas empty and the remainder in extremely poor condition. Mounds of discarded items littered the premises and the scene was one of dereliction. A sad end to a company which brought prosperity and employment to the town and its people. Elsewhere work continues on creation of the new showroom for Clifton Cameras and the youth club which will make use of the now unoccupied manse attached to the Tabernacle. 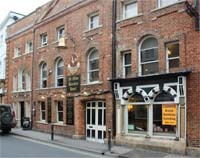 Change is afoot in other places too as "The Old Bell" has also been renamed "Ye Old Dursley Hotel". One has to wonder how long it will be before it reverts to the name by which it will always be known by anyone who llives in the area. Inside the main surviving factory building of Lister-Petter during its final few weeks, some of the remaining items are awaiting removal. A completely empty building inside the factory of Lister-Petter. Everything has been either transferred to Aston Down or has been discarded. Some of the remaining high racking at Lister-Petter. The racking has already been removed from the rest of the area. Piles of discarded items await disposal from the old Lister-Petter factory. Some of the final few engines produced by Lister-Petter await test inside the otherwise empty factory, . On the course of what was the old railway alongside the remaining factory, bins of discarded items await disposal. Work continues on merging two premises into one to provide a new larger showroom for Clifton Cameras. While the work goes ahead to create a larger showroom, Clifton Cameras is occupying a much smaller temporary building on the opposite side of Parsonage Street. Near the doorway to the tower of St. James' Church renovation work has taken place to some of the stonework. For an inexplicable reason the coaching Inn known forever as "The Old Bell" has been renamed "Ye Old Dursley Hotel". No doubt the establishment will continue to be called by its traditional name by all the locals. Work on converting the Tabernacle Manse for use as a youth club continues to make progress.